It’s a direction that wants to break a couple of cultural staples–the drop and electronic vibe–and replace it with something meaningful. But it tries so hard that it completely loses the experience. The M Machine are minimizing their own contribution within their own debut album. Glare comes off as a dull, 45-minute, rock interrogation in the form of simplistic synth, uninspired lyrics, and clumsy use of ‘awe.’ The San Francisco-based duo devote a few tracks strictly to production; and even then, they’re no longer than 2 and a half minutes, and act like interludes whose sole purpose is to support the recordings containing vocals that surround them. “Blind” is a stark contrast from the rest of the 12-track LP; in that it’s actually bright, airy, and has some resemblance of happiness. It even introduces the love angle quite nicely. It’s also the only song sung by a woman. Luisa Gerstein breaks through after some beautifully psychotic ambiance introduces a peppy beat alongside her quirky vocals. Even the tension building synth doesn’t scare her off. She continues to wishfully declare, “Hope you’re happy now” My guess would be a no. “Talking Machine” is dark electro with an intriguing Thomas Edison sample thrown in the middle. It represents their idea of fusion–reaching out and pulling in guitar riffs and Pink Floyd fancies, while concurrently establishing a bass haven. It’s not a bad song. But it doesn’t really know what it wants. The sample doesn’t necessarily make any sense in theory and placement. It’s just a mash-up of different points in music history. “Walking Underwater” is more of the previous but with a firmer direction. It actually spells out the duo’s disdain for love by describing their genuine confusion on the topic. There is still room for experimentation. But if sticking with music that only complements vocals, in other words, if pop music is their future, then this is a fine start. The Metropolis EP’s had focus and story without musical composition oversight. 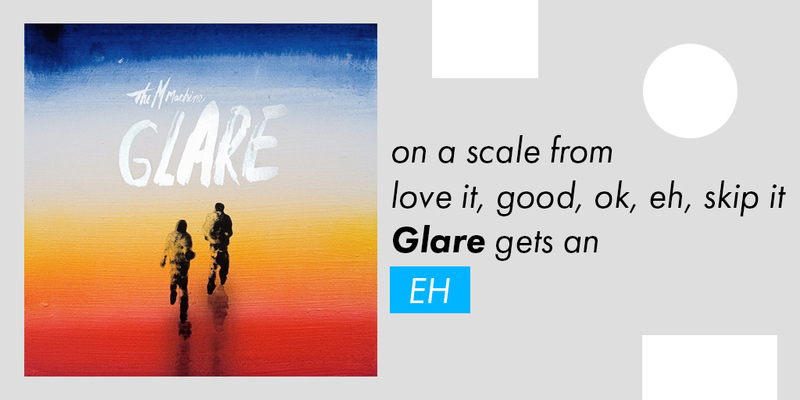 Glare has nothing remotely substantial to say about anything in particular. It’s a sort-of love album that lends a hand in the form of a human arm with robotic enhancements. And the duo might be aware from their choice of Edison sample: “My voice is the clearest, smoothest and most natural of any talking machine.” That’s just it. You’ve gone so “natural” that the machine part no longer exists. It’s better to own it and find what feels “natural” inside that magnificent, limitless contraption. Otherwise you’re left mimicking an electronic version of The Police, with leftover residue from Depeche Mode. EH.